Doorman-Priest serves at St. Luke's as a Candidate Pastor and Lay Minister. On my first Sunday in England, I attended DP's church. It was my first time to attend a Lutheran service. That's hard even for me to believe, but it's true. 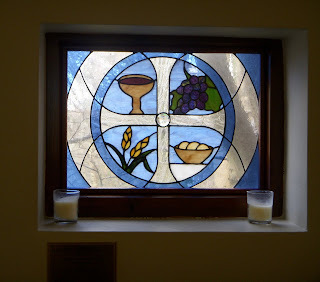 That Sunday was a Communion Sunday, and the service seemed somewhat like a cross between an Anglican service and a Roman Catholic service, but similar to both. I felt quite at home. The congregation is diverse. You can see by the schedule of services just how diverse. Along with members from European countries, there were those from African countries and perhaps the Caribbean. The church is quite near my hotel, but I managed to get lost, as seems to happen much too often, and I took the long way there. DP preached that Sunday, and a lovely sermon it was. You can find it at his blog, The World of Doorman-Priest. I thought it was so good that I wanted to applaud, but I didn't, being a visitor and all. I expect that he'll make a wonderful priest. That Sunday was Mothering Sunday, and members of the congregation were invited to go forward and take a flower, name their mothers, speak a descriptive phrase about them, and place the flower in the vases near the altar. After taking Communion, the communicants remain standing in place as the priest (well, a bishop that day) prays a blessing before they return to their places. It's a lovely moment in the liturgy. The church is next door to the bishop's house, and was once the stables to the house, but a lovely job of renovation made it into a small, but quite pleasant church building. Forgive me, but I'm rather proud of my pictures posted here. After church, DP drove me to his house, where I met the whole family, Mrs DP and their two lovely daughters, and we dined on Mrs DP's delicious lunch. After lunch we chatted and later watched "Lavender Ladies" with the marvelous actors, Maggie Smith and Judi Dench. I'd seen the movie before, and they had, too, but we all love it, and it was a joy to watch it again. Sunday was the worst day of my English cold, and I was sneezing and sniffling all afternoon. Mrs DP gave me my very own large box of tissues with a healing component embedded in them to use there and take back to the hotel with me. I needed them badly. The dears knew I needed a quiet day. God bless them. Dear Mimi, thank you for taking us to church with you, so to speak. They ARE nice photos and it's so nice to see DP in context. I love seeing these photos and reading your words. How wonderful that you could be there. 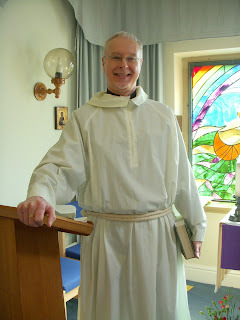 Doesn't our Doorman Priest look soo nice and wellcoming? It is nice to share your day with you and yes, DPs sermon was very good. Thank you. Mimi, thanks for this great post. It was so nice to see a photo of DP. Too bad "He Who Will Not Be Photographed" is missing from the memoirs ... our vision of him only in our imaginations! 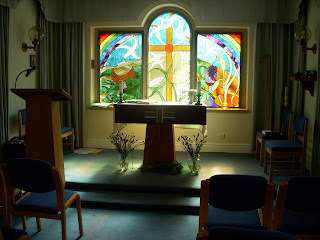 You can see the vases where we put the "Mother" flowers on either side of the floor near the altar in the top picture. My mother is named Pearl, and the thought that came to me was, "Pearl of great price," and that's what I said. Gosh. I scrub up quite well.